Garrett quickly went from being unknown to being a legitimate prospect in two sports. He didn't start playing organized basketball until his freshman year but jumped onto the varsity from day one. He has grown into a 6-foot-6 wing player with explosive leaping ability and committed to St. John's in 2011, his senior year at Findlay Prep High School in Henderson, Nevada. Amir is also interested in playing baseball. While playing on a travel basketball team during the summer of 2010, Garrett made time to pitch in the Tournament of Stars. He finally gave up basketball after the 2014 season. After all, it’s hard to stay ahead of professional hitters when you’re spending three quarters of your year working on another sport. And Garrett agrees he’s a better pitcher now that he’s given up playing college basketball. “It was fun doing (both) though,” he said. But it’s not just the added innings and increased instruction that have made him a better pitcher. It’s helped a lot that Garrett has been able to rework his body. Amir has a throwing program that incorporates yoga, long-toss and resistance training. Garrett does a fine job of making adjustments. He is very coachable and a quick learner. June 2011: The Reds chose Garrett in the 22nd round, out of Findlay Prep in Henderson, Nevada. They signed him on the August 15 deadline for a bonus of $1 million. The contract allows him to also accept a basketball scholarship to St. John's. But the Reds have some protection because the bonus is spread out over five years. Clark Crist is the scout who signed Amir. In the fall of 2013, after pitching for the Billings Mustangs (PIO-Reds) and Dayton Dragons (MWL-Reds), Amir transferred from St. John's to Cal State-Northridge, near his hometown of Los Angeles. In 2012, the Baseball America Prospect Handbook rated Garrett as the 18th-best prospect in the Reds' organization. He was at #15 in the winter before 2013 spring camps opened. They had him at #18 in the offseason before 2014 spring training. He was rated at 7th-best in the spring of 2015, then moved up to #3 a year later in 2016, and he stayed at 3rd-best in the Reds' farm system in the spring of 2017. 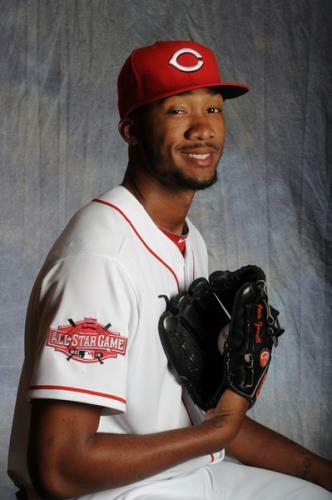 April 2013: Reds pitching prospect Amir Garrett, who is also a college basketball player for St. John's University, revealed on Twitter he is leaving school. Garrett disclosed that, at least in the interim, he will focus on baseball. Amir was a 22nd-round pick of the Reds in 2011. Better known as a basketball player in high school, Garrett caused a stir shortly before the 2011 draft. He wowed scouts as a 6-foot-5 lefthander who could reach 96 mph, and the Reds gambled on him in the 22nd round. They paid him a $1 million bonus while allowing him to play hoops at St. John's. When his playing time dipped as a sophomore at St. John's, he opted to transfer to Cal State-Northridge, which meant he had to sit out this season per NCAA rules. Garrett's hoops inactivity allowed him to report to Spring Training this year, and he arrived in Goodyear, Arizona in mid-February. He says he hasn't given up on basketball yet, but his development could really take off if he focused solely on baseball. On August 8, 2014, Amir informed the Reds' organization that he would be ending his college basketball career and focusing solely on baseball. “I love baseball, I always knew what my heart was telling me,” Garrett said. “I prayed about it. I felt like it was the right choice and I felt like it was at the right time, too. I didn’t want to rush it. I felt good with my decision, too. "I played (basketball) maybe two months in the summer, went to school, made the varsity basketball team, started and averaged a double-double,” Garrett said. “I was horrible, but I liked basketball—and I got really good at it. Amir is 6-5, 210 pounds and has a wingspan of 80-inches and a 32-inch vertical leap. Amir was selected by the Reds to play in the 2015 Futures Game. Garrett was named the Reds organization's 2015 Pitching Prospect of the Year (Sept., 2015). He was the best starting pitcher in the Florida State League, finishing second in ERA (2.44) and strikeouts (133) and third in opponent average (.230). He led the field with 8.5 strikeouts per nine innings. July 8, 2016: When Garrett gets to San Diego to participate in the SiriusXM All-Star Futures Game for the second time, he will be coming in on a roll. Garrett, who is ranked as the No. 4 Reds prospect by MLBPipeline.com, was also promoted from Double-A Pensacola to Triple-A Louisville. "Amir has done a great job at continuing to get better and better," Reds director of player development Jeff Graupe said by phone. "The arrow seems to be pointed way up, and he's progressed way faster than we even expected him to." Oct 12, 2016: In a small conference room in the lowest level of Louisville Slugger Field sat Reds prospect Amir Garrett; the plush office chair underneath him dwarfed by the frame of the 6-foot-5, 210-pound left-hander. Leaning back, hands behind his head, Garrett's posture carried a certain aloofness. Although soft-spoken, his words paint the picture of a competitive and confident player. "There's always room for improvement," Garrett said. "I think I'm, for the most part, pretty much ready [for the Majors] right now." After his 2016 campaign, Garrett has a lot to be confident about. In his second full year since foregoing his basketball career to focus on baseball, Garrett made some of the biggest strides of any player in the organization. With a plus fastball and slider, Garrett blazed through his first season of Double-A with a 1.75 ERA in 12 starts. Midway through the season, Garrett earned a call up to Triple-A Louisville and posted a 3.46 ERA in 11 starts, finishing his season with a combined 2.55 ERA in 145 innings and earning the Reds' Pitcher Prospect of the Year Award by MLBPipeline.com. "I think it's gone really, really well, better than I'd expect," Garrett said. "I ran into some troubles up here [in Louisville], just a little bit, not too much, but I've been able to make adjustments. I think I've been able to handle myself pretty well in this league for the short amount of time that I've been here so far, and I feel like every start I'm learning something new about myself. "While his Double-A dominance produced some eye-popping numbers —it bumped him up to the No. 2 Reds prospect and No. 57 overall prospect on MLB Pipeline's midseason prospect grade—it was how he adjusted in Triple-A that gives the most promising signs for his future. "He's a quick learner, he makes adjustments pretty fast," Louisville manager Delino DeShields said. "That's rare for a lot of young players. Not just pitchers, but position players as well. It's one thing to work on stuff in the batting cage and work on stuff on the side, but to be able to take it into the game at 7:05 is something different." Garrett couldn't shake baseball over basketball permanently, in part, because of the memory of his grandfather, Mack Wysinger, who went by "Pops." Wysinger died when Garrett was in eighth grade. It was Pops who turned Garrett on to baseball, and he never forgot. April 7, 2017: Garrett was admittedly antsy waiting to make his Major League debut against the Cardinals. "I woke up pretty early, at 7:00 a.m. I was nervous the whole day," Garrett said. But Garrett was able to busy himself with some shopping and a nap before coming to the ballpark. Once he stepped into the clubhouse and later, onto the mound, his nerves were checked at the door. The 24-year-old tossed six stellar innings in a 2-0 Reds' blanking of the Cardinals. "When I came to the ballpark, I just told myself it's another game," Garrett said. "I came in here and talked to the guys, got a couple laughs out of Finny [Brandon Finnegan], Rookie [Davis], talked to them. I just went out there, and just had fun with it." Garrett allowed two hits and two walks with four strikeouts. No Cardinals batters reached second base when he was on the mound. He was the third Reds pitcher since 1913—and the first since Wayne Simpson in 1970—to throw six or more scoreless innings in his big league debut. It was also the first time a Reds pitcher debuted with a win against St. Louis since Keith Brown on Aug. 25, 1988. Of the 78 pitches Garrett threw, 40 were his four-seam fastball, and it averaged 91 mph and topped out at 93 mph according to Statcast. "I was mostly fastball-changeup to lefties," Garrett said. "I [threw] a slider a little bit. I was able to spot up my fastball really well, going in and out, up and down. My changeup was really good. That was the pitch for me [used five times] I felt was the key of the game." "Extremely mature and polished young guy. That was a very impressive debut," Reds manager Bryan Price said. "From what I've seen of Amir, he just doesn't self-inflict and doesn't get himself in trouble, and not trusting his stuff. He has great faith in his ability, and that allows everything he does to play up a notch." The Reds No. 2 prospect, and No. 64 overall, according to MLBPipeline.com, Garrett won a rotation spot with a strong spring. Despite a sojourn into high school and college basketball from ninth grade until 2014, Garrett focused full time on baseball by 2014, three years after the Reds made him a 22nd round pick in the 2011 Draft. Playing basketball in New York for St. John's University was an experience Garrett could draw on in front of 44,653 fans at Busch Stadium. Jan. 8, 2018: Garrett got engaged to his girlfriend, Tausana. May 3-6, 2018: Amir was on the bereavement list. Jan 18, 2019: Amir Garrett spent the morning grinding at the Reds' Spring Training complex in Goodyear. Camp starts soon, and the left-hander wants to be ready when pitchers and catchers report in a few weeks. He's either going to start or pitch out of the bullpen this season, and he's fine doing either job. He's just as confident that his team is going to surprise the doubters this year. Plus, there's a new manager and pitching coach in Cincinnati to impress. But the lefty's biggest delivery of the day came during his lunch break, 30 miles east of the club's complex and nowhere near a mound. The pitch was perfect. "This is it, guys. You are very fortunate. Take in this experience," Garrett said to the 60 participants at this year's Dream Series. "Remember what this looks like, what this smells like, and how this feels. You might be at a Spring Training clubhouse now, but this is the big leagues, and let me tell you this, there is nothing better than being in the Major Leagues and being a Major League player." The Dream Series, which runs in connection with Martin Luther King Jr. Day, is designed to develop pitchers and catchers for a future in baseball and diversify the future talent pool. The event continues through Monday at Tempe Diablo Stadium, the Spring Training home of the Angels. In addition to on-field training with former Major League players, the camp includes daily presentations from people like Garrett, former Major Leaguers, scouts, college administrators and MLB umpires. The event also features information on baseball career opportunities at the collegiate and professional level. "I think any time you can connect the dots and have kids identify with guys close to their age, instead of me, who is 100 years old, and that's a good thing," said former MLB manager Jerry Manuel, who is serving as an instructor. "Here is somebody who's their age and saying, 'Hey, this is a good sport to be in, it's cool, there's longevity.' It's just rewarding that you have these types of guys that want to speak baseball life into guys that think they have a chance to play." Garrett shared the ups and downs that came with his unusual path to the big leagues during his 30-minute chat. He elaborated on the experience of being a two-sport star -- baseball and basketball -- in high school and the responsibility that comes with being an elite athlete at an early age. But most of all, he implored the teens to take advantage of the opportunities in front of them. "I didn't really have this when I was younger playing baseball, but I just feel like it's a good thing for kids," Garrett said. "They get to be out here playing baseball, and they get to know the game from a lot of guys that played it at the highest level for many years. It's a good thing. They just have to take that knowledge and run with it." The first day of workouts began with high-tech assessments through Prospect Development Pipeline screenings. A few hours later, the pitchers threw bullpens, practiced pickoffs and participated in fielding drills. The groups of catchers worked on defensive drills and conditioning. "Being around big leaguers, I think it's really fun and very helpful," said right-handed pitcher Evan Adolphus, a senior who has committed to Cal State Fullerton. "You get to pick their brain on certain things. If we have issues on certain pitches and certain mechanics, they can fix that, when it's not the same as high school coaches teaching it." Garrett spoke during the lunch hour. The teens wrapped up the first day by hitting in the cages and on the main field. "We had a great first day and there was a lot of good things we saw," said Del Matthews, MLB's senior director for baseball development. Garrett is a strong-armed lefthander. He has a 90-97 mph 4-seam FASTBALL with some natural tail that he can throw to both sides of the plate. He has a decent (45 or 50 on the 20-80 scouting scale) 78-81 mph SLIDER (which is also called a curveball) has excellent shape, and some bite., for his swing-and-miss out pitch. He also has an 80-83 mph CHANGEUP that he throws with good arm speed, messing up a hitter's timing. Amir can throw his slider for strikes and at any time in the count, but it needs more consistency. 2017 Season Pitch Usage: Fastball 62.4% of the time; Changeup 15%; and Slider 22.6% of the time. 2018 Season Pitch Usage: 4-seam Fastball 55% of the time, his Sinker 8.2%; Change 3.5%; and Slider 33.4% of the time. Average velocity: 4-seam 95.8 mph, Sinker 95.5, Change 85.3, and Slider 84.3 mph. Amir has a high three-quarters arm slot and he gets some tilt on his breaking pitch. When signed, he was extremely raw in all aspects of baseball. And he hasn't had much experience since then. So he has trouble repeating his delivery, still. That is because, with extremely long legs and arms, the 6-foot-5 lefty has to work to repeat his delivery, and he’s slow to the plate. He exhibits good composure on the mound. "He's got a different swagger on the mound," Louisville manager Delino DeShields said midway through the 2016 season. "His competitiveness is really sticking out, to me. He carries himself a little different from the other pitchers that you might see. His swagger is probably a little different —probably because he played a little hoops." And the 6-5 southpaw sees the batter vs. pitcher matchup—the heart of baseball—as a battle similar to a one-on-one game of hoops. "I always have that mentality," Amir said. "Basketball is different. When you go up against somebody, it's like, 'You're not better than me.' It's something that you just have within you. When I go out there and pitch every five days, I see a batter and I'm like, 'You're not going to win this battle." Amir likes to talk to hitters and see what they’re thinking. Over and over, the 6-foot-5 southpaw with a high-90s fastball has been told by hitters that the hardest pitch to hit is a good changeup. That helped reinforce the message that was given to him by big league manager Bryan Price in spring training: Work on that pitch. October 2016: Garrett was named the MLBPipeline.com Reds minor league pitching prospect of the year for 2016. Garrett can be a mid-rotation starter with improved command. Otherwise he could have a lengthy career as a lefthanded reliever relying on his fastball and slider. Amir stands on the hill as if that mound is his own personal property, daring anyone to set foot on it. That is why before every inning he walks to the back of the mound and draws a huge "A" in the dirt. That's "A" as in Amir. "That's something I've always done since I began pitching," Garrett said. "I look at it as if, 'This is my mound, my domain. That's my home right there.' I do that every game, every inning—carve that "A" in there." Not only does Garrett protect the mound like a junkyard dog, or like his pit bull Dozer. ("His name is Dozer, because he is like a bulldozer," Garrett said.) Amir stays cool, calm and collected. (Hal McCoy - Reds Report - May, 2017). 2018 Improvements: "He's aggressive. He's doing exactly what he did in Spring Training, that's attacking the zone and coming after the hitters with his best stuff," Reds manager Bryan Price said. "He's varying his times to the plate, he's offsetting the timing of the hitters with his slide step and his regular delivery, and he's been able to get that slider over also, which has really helped." The slide step is a tool for pitchers to speed up their delivery, especially with runners on base. But Garrett also has been doing it with the bases empty. He began working on it during the offseason after he recovered from a right hip injury that required stem cell, platelet-rich plasma injections and rehab to correct. "I thought I would have to make an adjustment for my hip. I don't really need it, but it feels good doing it," Garrett said. "It throws off the hitters' timing a lot. If I can do that a couple of times, and then they see my regular leg kick if I go to that, it's a good weapon for me to have. A few months after Garrett’s 19th birthday, the Reds — having seen him throw in the mid-90s during a tryout camp — selected the southpaw in the 22nd round of the 2011 draft. Shortly thereafter, they introduced him to a pitch other than a fastball. Whether or not it’s a slider is an exercise in semantics. Lee Tunnell knows what it is. As Cincinnati’s bullpen coach, he understands the intricacies of Garrett’s go-to secondary better than anybody. Does Tunnell consider it a slider? Let’s just say I used the term when asking about the pitch, and he used the term in return. Which doesn’t necessarily mean that it is. Or that it isn’t. Garrett’s “slider” has a low spin rate [roughly 1,800 rpm] and only a modicum of horizontal break. The vertical movement is decent, but not to the point where the pitch could be categorized as a ground-ball-inducer. Velocity-wise, it’s 10 mph slower than his heater. Did that describe a changeup? Or maybe it’s simply a slider that doesn’t slide? A backup slider, or the fabled gyroball. Both can flummox. A batter will read slider spin out of the hand, and react to movement that never materializes. As of the start of the 2019 season, Amir had a career record of 4-10 with 5.93 ERA, having allowed 31 home runs and 130 hits in 133 innings. Garrett's basketball skills translated to the defensive responsibilities of a pitcher. May 24-June 4, 2017: Garrett was on the DL with right hip inflammation. Aug 29-Sept. 10, 2018: Garrett was on the DL with bone bruise on left foot.